Wet to moist. Sedge meadows, calcareous fens, shores, streambanks, ditches. Full sun. This is a 4″ to 32″ tall, erect, perennial forb that rises from a rhizome and fibrous roots. It often forms colonies. 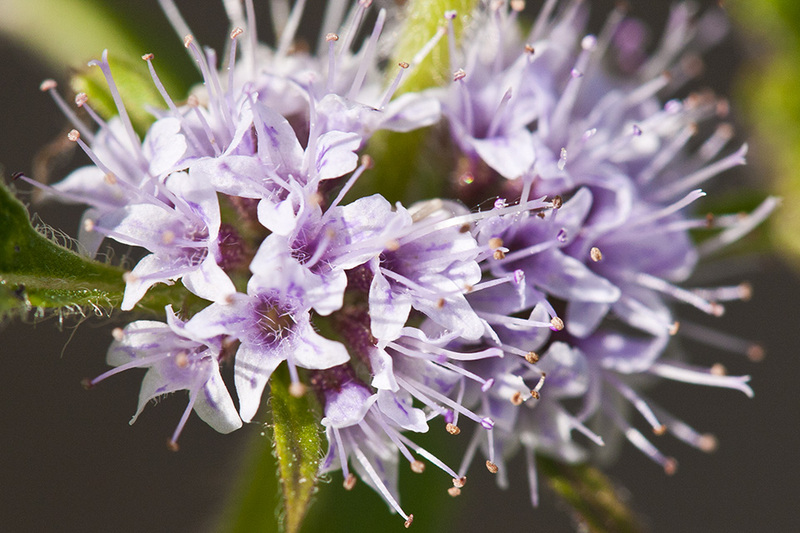 The plant is highly aromatic and can often be detected by its minty odor before it is seen. 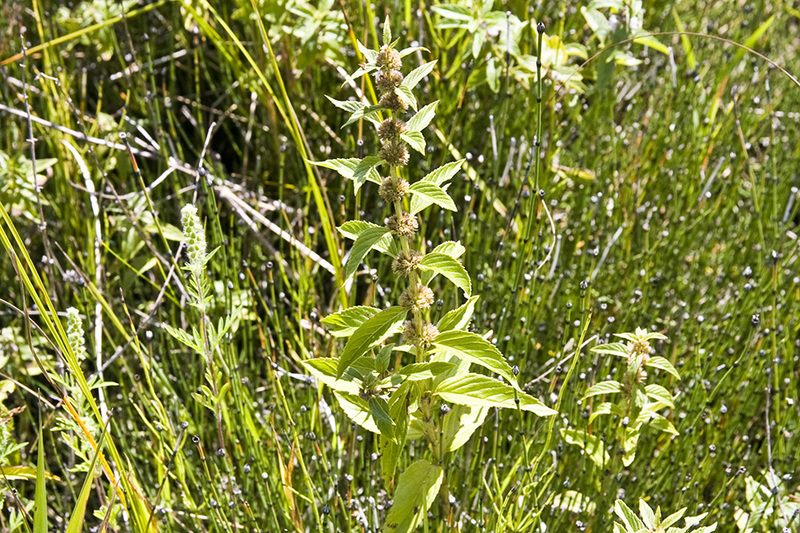 The stems are erect or ascending and square. They are covered above the middle, especially on the angles, with both spreading, barely curved hairs and appressed, downward-pointing hairs. They are hairless near the base and often hairless between the angles. The leaves are opposite, broadly lance-shaped or egg-shaped, ¾″ to 3⅛″ long, and ¼″ to 1½″ wide. They are on short leaf stalks. They are wedge shaped at the base and taper to a point at the tip. The upper surface is hairless or nearly hairless. The lower surface is sparsely covered with short, soft hairs. Both surfaces are covered with minute, sunken glands. The margins are toothed except near the base with sharp, forward pointing teeth. When crushed, the leaves have a strong mint aroma. The inflorescence is a dense pair of branched, round-topped clusters of up to 20 or more flowers rising from the axils of opposite pairs of middle and upper leaves. The adjacent clusters form false whorls. The space between the nodes with flowers is about equal to the space between the nodes without flowers. The flowers are ⅛″ to ¼″ long. There are 5 green, hairy sepals (calyx) united for most of their length into a tube then divided into 5 short lobes. There are 5 white to light purple or pink petals, united for most of their length into a tube then divided into 2 lips. The upper lip is a single lobe with a notch at the top. The lower lip is divided into three, nearly equal lobes. The division of the corolla into two lips is not obvious, and the corolla has the appearance of having 4 regular lobes. There are four stamens of nearly equal length that protrude well beyond the corolla tube. The fruit is a smooth, light brown nutlet less than 1 ⁄16″ in diameter. Spearmint (Mentha spicata) inflorescence is a spike-like cluster of flowers at the end of the stem. 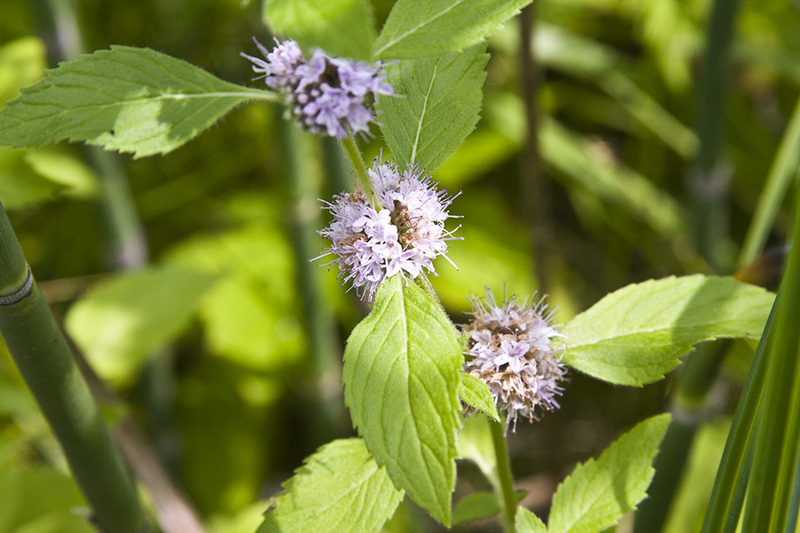 Field Mint (Mentha arvensis), also known as Wild Mint, Corn Mint, or in the case of M. arvensis var. canadensis, Canada Mint. It grows and is native to the temperate regions of Europe, western and central Asia, east to the Himalaya and eastern Siberia, and North America. 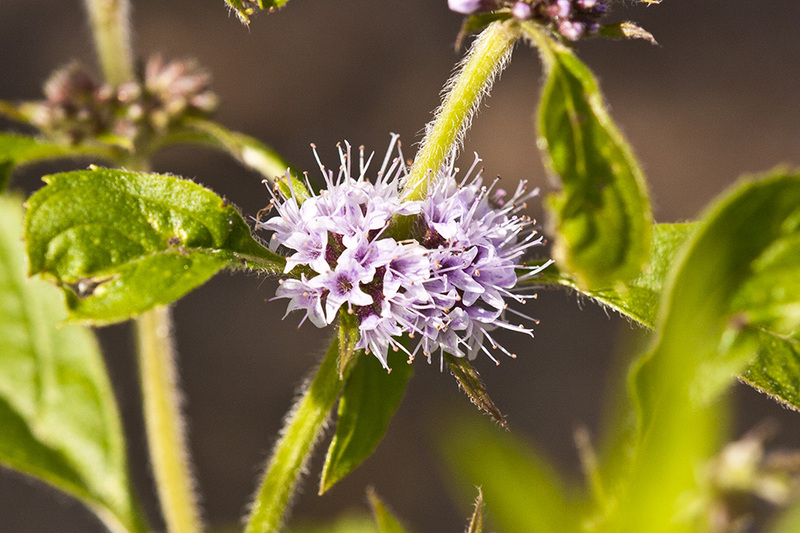 A member of the Mint (Lamiaceae) family, it can be used to make teas or jelly. Traditionally, it had been used to treat colds, pains, and swelling. The Nlaka'pmx peoples would place mint leaves around their dwellings to help ward off insect pests. 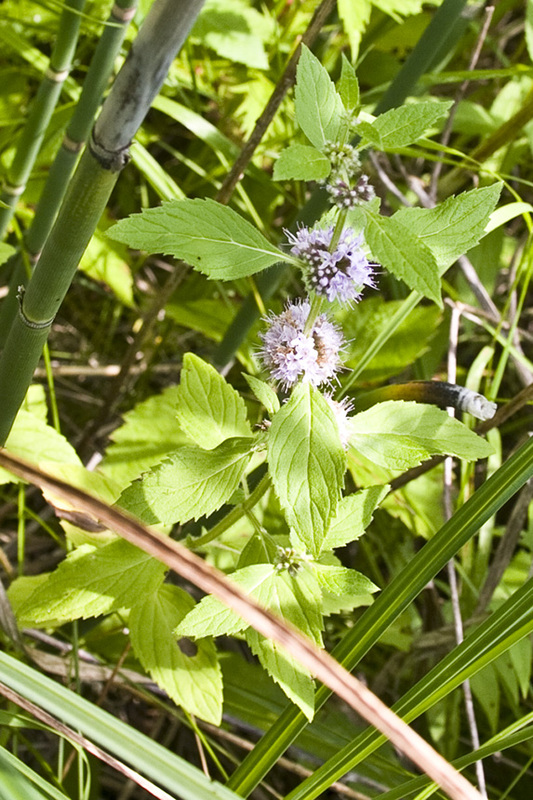 Mentha arvensis grows in lower to mid-elevations, preferring wet seepage sites, the edges of wetlands, and lakeshores.